In CW’s Jan./Feb. issue, we began a year focused on prayer. Our prayer calendar for the months of November and December can be found on pages 27-28 of the November/December issue, or it is available to download here. Each day has a scripture to direct our thoughts. 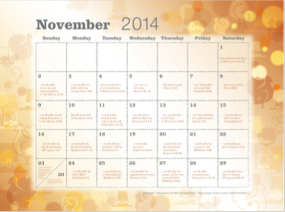 In November we will be focusing on prayers of thanksgiving. In December, we will focus on praising God through the Psalms. Click here for the fourth part of our calendar, from the July/August issue. Click here for the fifth part of our calendar, from the November/December issue.